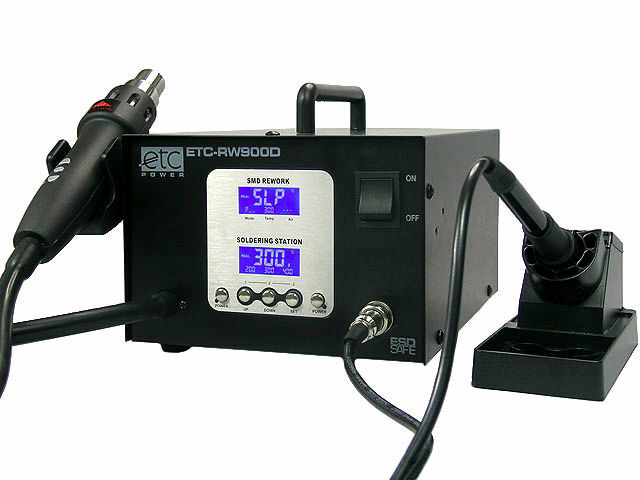 ETC-RW900D is a digital, double-function service station equipped with soldering iron and a hot air supply. Thanks to the powerful heater and microprocessor control system, it can be used in laboratories, service points, or in production. High precision in temperature and air flow regulation makes the station a perfect choice for soldering and desoldering even sensitive SMD components. Additional advantage of the station is the ability to set up parameters using the buttons located on the soldering handle. can operate in lead-free technology. automatic cooling of the heater.